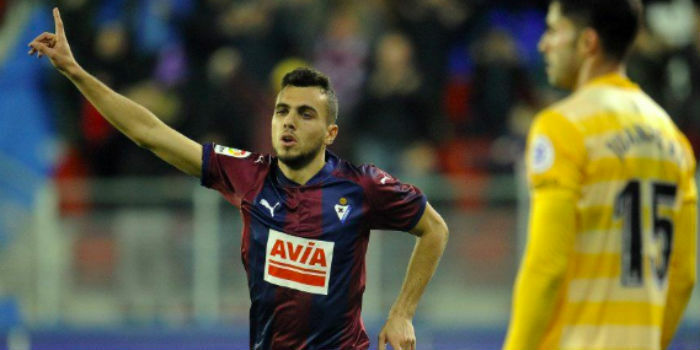 According to Estadio Derportivo, Unai Emery has identified Eibar’s box-to-box midfielder Joan Jordan as a potential midfield recruit this summer. The Gunners are set to lose Aaron Ramsey to Juventus on a free at the end of the season and with doubts over the long-term future of Mesut Ozil, Mohamed Elneny and even Henrikh Mkhitaryan, the Spaniard is on the hunt for good value players who’ll fit our tight budget. Jordan, no relation to Sp*rs’ nutcase Joe, has been a mainstay in the Eibar midfield this season making four assists and scoring three goals in 29 appearances this season. The 24-year-old, who has previously played for Espanyol and Real Valladolid, is under contract at the Ipurua Municipal Stadium until 2020 and has a release clause of just £12.8m. It’s thought his owners will want to do business this summer for fear of losing him on a free in a year’s time. Since Sven Mislintat’s departure, the job of getting transfers over the line appears to be a collective effort, involving scout Francis Cagigao, head of football Raul Sanllehi and the coaching team, led by Emery. It’s been leaked by the club that our plans for the summer are in good shape, time will tell whether Joan is part of them. Feels a little like the captain of the Titanic telling everyone everything’s fine while water swirls round his ankles. No. Actually it makes perfect sense that the club have made their plans and identified their targets early enough before Sven’s departure. Who are these people who trust the club with transfers? Don’t think it’s slightly suspect that we lose a very highly regarded member of the backroom staff, are rejected by another and then miraculously hear that it’s fine because all our business is in place already..? You have more faith than I do! Four Assists all season? I know there’s a lot more to it that this but am I the only one a little underwhelmed by news or this sort? Not that the article is pointless as it’s interesting to hear about any links (we all love a link). But doesn’t it seem that we are sniffing around players with the likes of Everton, West Ham et al rather than MC, Liverpool etc? And again, I know it’s not all about huge name signings, as we have very well been shown in the past but bloody hell! Am I over worrying here? It’s where we are as a Europa club. We have to try identify good cheap talent and hopefully make the best of them. If Liverpool, Athletico or Dortmund bought him and made him a super star we’d be all “why don’t we do that” so good for the club if it’s true, at least they are trying to get things moving. People don’t always realise that clubs make almost ten times more out of CL qualification than from the Europa League, and the gap increases in the later stages. Our business plan is (was?) based on CL income 2 years out of every 3 so we’ve lost out on at least £50 million in the last two seasons. As we’re not able to compete with the “usual suspects” head on, we have to try to be cleverer when buying players, whether or not that’s Jordan. Unfortunately, we’re shopping in the “bargain basement” because we don’t have the funds available to clubs like City, Utd, Chelsea and Liverpool, for a variety of reasons. Also, since Kroenke took full control there’s been an economy drive going on – particularly to cut our wage bill. It appears there’s around £40 million available to Emery in the Summer. If so, I suspect part of the new Adidas kit deal money is providing that. It’s unlikely we’ll make much of a profit in the year ending 31 May 2019 to add to the pot though. However, if we get CL qualification then that’s at least £25 million extra, and presumably it will be for transfers, but we aren’t there yet. Stats don’t tell the full story. Eibar could be a poor team with a defensive style of play and lousy attacking players. I don’t know about the team or player, I’m just saying a better team could unleash a very good player. Need I remind you that Cazorla’s stats were also often misleading. He could be Guendouzi’esq bargain. He plays for Eibar, who presumably don’t have high class attackers to feed, which may be part of the problem. Never heard of him until now, but he fits the main criterion: he’s cheap! With around £40 million available in the Summer – more with CL qualification, of course, but that’s far from certain currently – we’re going to have to spread that dosh cleverly and fairly thinly. This has to be sarcasm right? Though, if we could get Alderweireld, who is leaving on a free, I would view it as Sol Campbell 2.0, rather than some joke. Good name. Not as fabulous as ‘ Martin Marvin ‘ though. Wonder whatever he’s up to. I’ll admit that when the headline loaded faster than the image I assumed this was an Arsenal Women article…. Same..and I’m a woman in case there should be cries of sexism! I don’t know how he could leave that stadium. It’s one of the most unique in the world. Time to have a look at him on YouTube! Can’t wait to see ESRowe and Reiss back into the first team next season. Good piece on Arsenal website player covering both of them out on loan in Germany. Pity SmithRowe injured and Nelson dropped form but great opportunity for Nelson at Rwing and SmithRowe to take over from Rambo eventually. We don’t have to be just looking at cheap bargain basement in market. In fact much of these ‘rumour’s ‘ are started by agents trying to link to us as a gold standard for their client. Most fans tend to be naive such an easy sell for the papers. From the few clips I’ve seen, he seems more a Xhaka replacement than Ramsey’s. Technically, looks a definite upgrade on Xhaka (I love Xhaka). Some very neat turns, passing range and awareness. Only if he has a bad attitude! I get the awful feeling PTSD rates will skyrocket among the Goonership after the transfer window. It’s got all the hallmarks of an absolute classic shitshop. More believable than the Umtiti link I saw earlier. Most things are though I suppose.